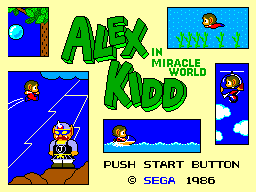 This is my first review of a Sega Master System game so I shall start with one of my top 5 Sega master system games of all time: Alex Kidd in Miracle World (Released in the UK in 1987). The gameplay is the main reason this is one of my favourite games. 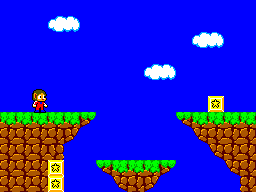 You play as Alex Kidd as he journeys through Radaxian punching enemies, playing paper-rock-scissors against seven bosses (three of them repeated) and ride several vehicles. There's so much variety in the the levels. Like I said, you get to ride several vehicles which really makes for some interesting and fun gameplay and breaks the repetitive platforming and punching blocks. One minor criticism is that the game is pretty difficult for first time players mostly because of the paper-rock-scissors battles which you will only know the way through memorization, also known as trial and error. Still, once you get used to the games difficulty, you will be able to beat it with very few problems. The game looks amazing and really shows the Master System's graphical improvements over the NES. The levels are very bright and colourful and the sprites are very detailed and are animated pretty well. What more could you say. Honestly, it might be my favourite music on the Master System. The tunes are extremely catchy and memorable and they have been stuck in my head ever since I first played this game. The sound effects are pretty good although the jumping sound can get a little bit annoying but it's fine. It's a controversial opinion but I think the 17% slower 50hz PAL music is a little easier on the ears since it makes the tunes less repetitive. The control is solid for the most part. Button 1 is jump and Button 2 is punch unless you own the built in version which has the buttons swapped. There's no delay on the control at all, it's all responsive and works very well. There are several problems, one is that your momentum is a little slippery making precise platforming a challenge. Also the swimming control has a weird resistance to it and I have to admit this got me several game overs near the end of the game because of the tight spaces between the spikes. Thankfully most of the levels are designed with this control in mind so it's not a game breaking problem. There is some replay value in this game. There are a few bonus rooms, some well hidden secrets you won't find your first time and as I said before, there are vehicles in this game but you have to buy one from the shops first. This leaves you a choice, do you want to buy the vehicle and speed through the level or you can ignore buying it and add some extra challenge to the game thanks to good clean fun platforming. 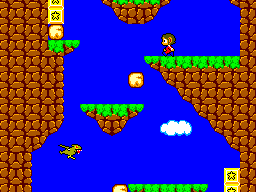 Overall Alex Kidd in Miracle World is an amazing game. In a lot of ways I prefer it over Super Mario Bros 1 for the NES. I also think IMHO that the 50hz PAL version is better than the 60hz NTSC version. I'll explain why another time when I eventually review another Alex Kidd game. Thank you for reading. PAL gamer out.